Sprint Express is a QWERTY powered Android phone which is going to launch on 18 November. I have no idea about the manufacturer of this handset but normally Sprint launches Samsung, Motorola and HTC designed smartphones. It runs on Android 2.3 Gingerbread operating system. It is an entry level device so you can easily understand that it will bring some low-end specs. 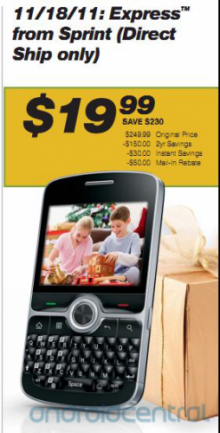 Sprint Express handset is designed with a portrait-style form factor and with a 2.6-inch display. Youngsters will feel interest in this entry level phone just because of a QWERTY keyboard. The reason is that they will be able to be connected with their friends and buddies by sending the messages and emails via this keyboard. Great ease and fast speed of typing is on hand for them. It is powered by a 600MHz processor so you can expect a good processing power. There is a rear 3.2MP camera so that the users can capture the still and video images. It is expected that Sprint Express will be launched by the carrier on 18 November before Christmas with a price tag of $19.99 however the customer will have to sign a new two year agreement.